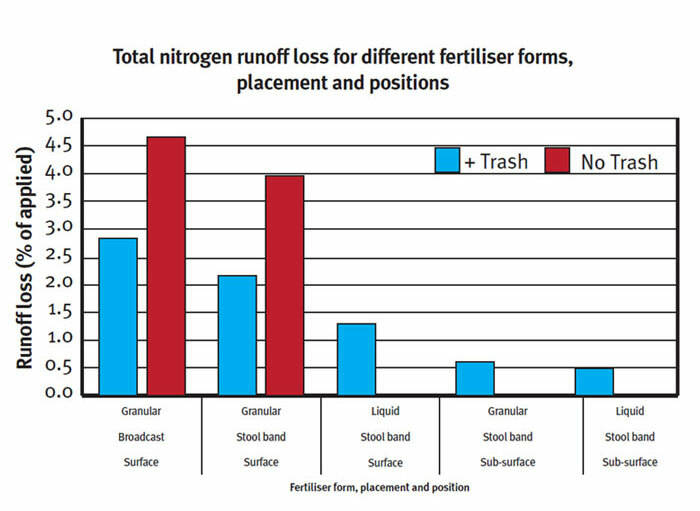 Sub-surface fertiliser application reduced runoff losses of nitrogen, phosphorus and sulphate-S from recent applications when compared to surface application. 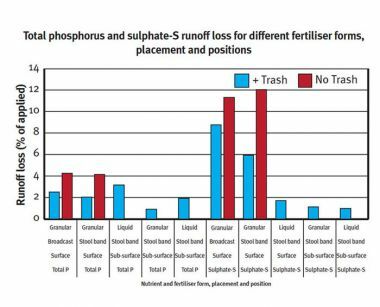 The presence of cane trash reduced the runoff loss of nitrogen, phosphorus and sulphate-S from recent applications when compared to trash removal. 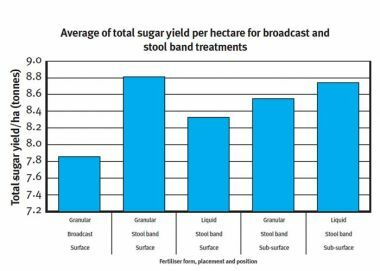 The improved practice of sub-surface fertiliser application increased yield (total sugar per hectare) over broadcast application and reduced the runoff nutrient loss. The application of fertiliser provides essential nutrients to enhance sugarcane growth and yield. The rate of application is important. Similarly the type of fertiliser (e.g. granular versus liquid) and where the fertiliser is placed in the soil profile can influence plant uptake and the loss through run off and deep drainage. provide nutrient runoff loss data to enhance predictive modelling of the effectiveness of improved management practices. Fertiliser was applied to ratoon cane in two field replications using traditional and improved application practices. Trash was removed from selected plots one day prior to the application of the fertiliser treatments. Seven days after fertiliser application each plot (1.7 metres long by one metre wide centred over the cane row) received simulated rainfall (average 77 millimetres per hour) until runoff commenced and then for a further 30 minutes. Samples were collected during the runoff event to determine runoff rate and nutrient concentration in runoff. The table below details the five experimental treatments with the fertiliser form, position, placement and trash treatment combinations, and the respective nutrient application rates (kilograms/hectare). 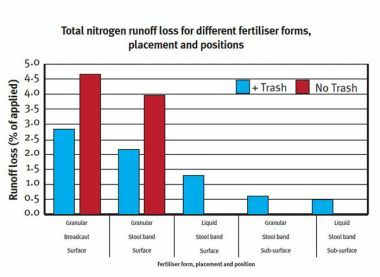 Sub-surface fertiliser application reduced the nitrogen, phosphorus and sulphate-S runoff loss by over half compared to surface application. Trash retention also reduced the runoff loss in surface applications. Total sugar per hectare was significantly higher in sub-surface stool band treatments (p<0.05) compared to granular broadcast. Bruce Cowie, Luke Davison, Wendy Tang and Melanie Shaw (Queensland Government Department of Natural Resources and Mines); Lawrence Di Bella and Ash Benson (Herbert Cane Productivity Services Ltd).